Not everyone lives in the colder north. Pollinator gardens are possible and needed in tropical and subtropical climes, due to the continued loss of habitat there. 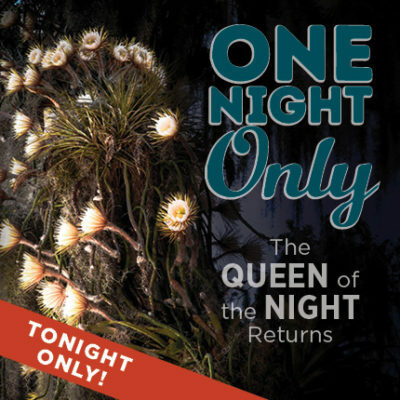 One of the most fascinating groups of plants and their pollinators is the night blooming cactuses of subtropical and tropical America. This is a surprisingly large group, with many species (Wikipedia). 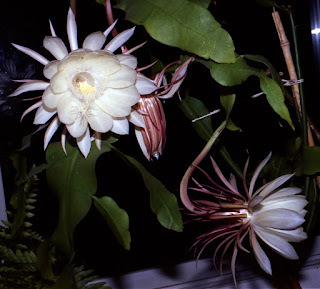 The one I grow is probably Epiphyllum oxypetalum which is a native of southern Mexico to South America. This is one of many cacti pollinated by bats and some sphinx moths. The amazing videographer Louie Schwarzberg shows this in his The Beauty of Pollination clip. Look for the mama bat carrying her child! And, near the end of the portion on bats, there's a bat coming by some months later and eating the delicious fruit of the cactus. That's right, many of these cacti have large, good tasting fruit. One of the best known (find it in most Chinese or Vietnamese groceries) is the dragonfruit. 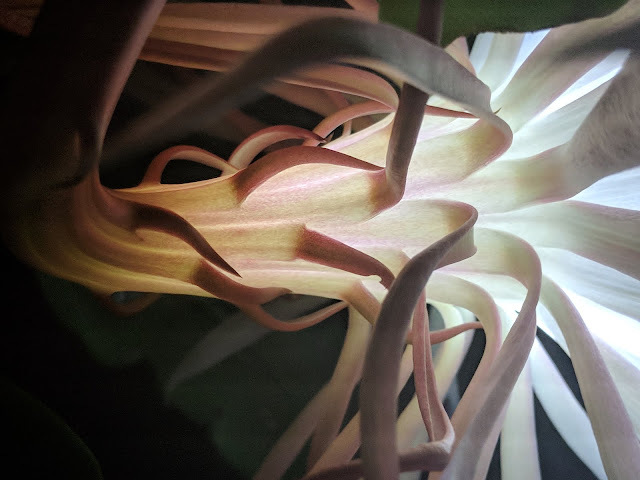 My night blooming cactus tempts me for many days before the event with the gradual growth of the bud, starting from a tiny pip on the edge of a leaf to a 3-6 inch bizarre object which finally begins to show white on the petals. Then I know that it will open the coming sunset. I try to invite friends and neighbors over for that evening to sip a glass and watch the process. About half an hour after sunset the petals will begin to open, in a process that may take an hour or more. When the outer petals are forming alien-looking spikes at right angles to the main flower, it's fully open and then the fragrance begins to build. You can see a nice time-lapse video of a potted plant blooming at YouTube. 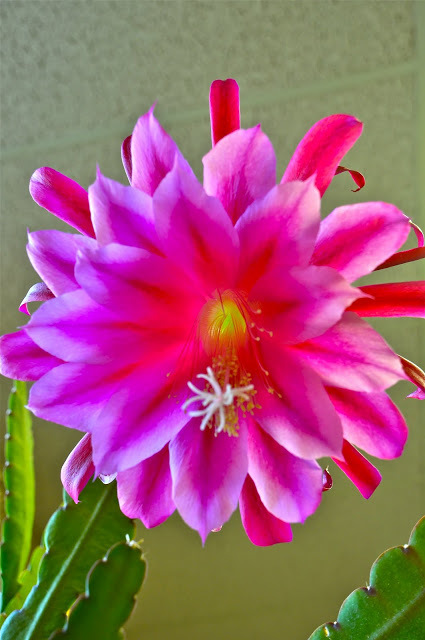 If you want to grow Epiphyllum oxypetalum as a house plant it's not hard. Give it a freely draining soil and bring it indoors well before frost. During winter, give it hardly any water and no fertilizer. Around March-April, long thin stems will begin to grow upwards, possibly reaching 10 feet in a really vigorous plant. You can pinch these to keep them in bounds. Short air roots grow from these stems, which the cactus uses in nature to anchor itself to the bark of tree trunks or to rocky slopes. Once it is reliably mild outside, you should move your cactus outdoors. But, for the first week or two, make sure to keep it totally shaded - otherwise the leaves will burn. I cover my plant with a muslin-like cloth at first. In Toronto's latitude, after this hardening off the cactus can take full sun. As soon as it is ready for sun, you can start giving your plant plenty of water with a low-nitrogen fertilizer, diluted to half strength. Once it gets hot, the skinny stems will begin to widen into flat green "leaves". After leaves have matured for a month or two, you'll find small swellings on their edges that grow into flower buds. Around the world, those lucky enough to have night blooming cactus ready to pop have thrown parties that may go dawn to dusk. “Bristol’s Cereus Puts on Show” shouts the headline. An eye-popping photograph shows the trailing leaders of a huge plant with about 29 flowers in bloom. 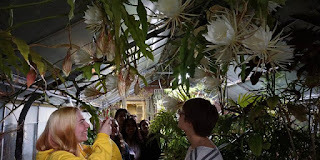 The caption explains they are only a portion of the 200 or so that opened on a night-blooming Cereus in a greenhouse on the estate of a certain William L. McKee. This from the Providence Sunday Journal, August 8, 1937. 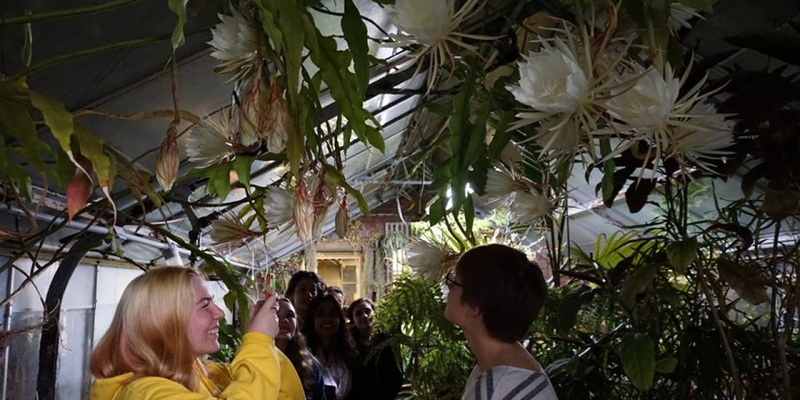 “The flower bears some resemblance to a huge white tulip and exudes a powerful, sweet fragrance, completely permeating the atmosphere of the hothouse.” This particular specimen, Mr. Owen explained, had been developed from a cutting brought from Peru 30 years previous. The plant had spread the entire breadth of the building, some 14 feet. 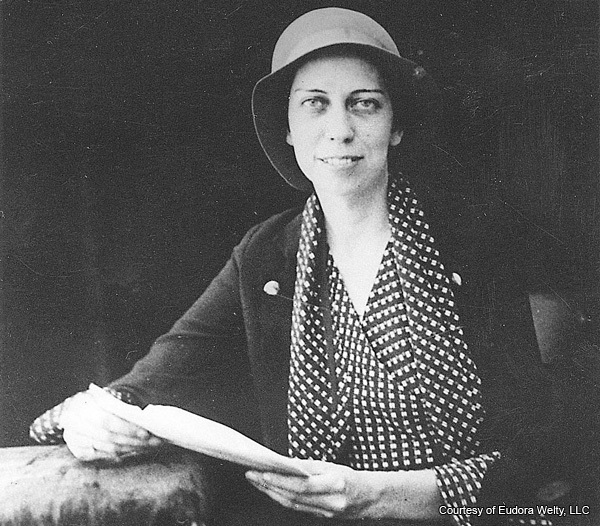 Eudora Welty was a celebrated Mississippi writer, who had a beautiful garden. 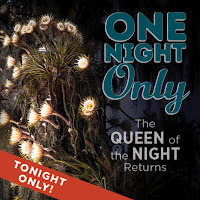 In her book The Golden Apples she wrote that when her night-blooming cereus plant (“a naked, luminous, complicated flower,”) began hinting at exposing its fragile white buds each year, Welty would throw parties that would last from dusk until dawn in its honor. The Pollinator Gardens project is creating gardens for native birds, bees, and butterflies. We use native plants to provide nectar, pollen, larval food and habitat. Our gardens are beautiful, educational, and help threatened native species.